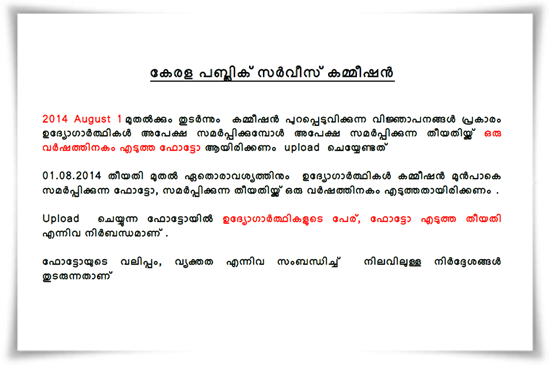 Kerala PSC announcements instructions regarding photo upload in malayalam August 2014 is given here. According to the notification provided by the Kerala Public Service Commission, from 1st August 2014 onwards while submitting the applications, candidates should upload the photos taken within a year. Read more to know about the Kerala PSC announcement and instruction regarding the photo upload. Kerala Public Service Commission has notified an updated instruction regarding the uploading of photo along with the application. According to the latest notification, from 01.08.2014 onwards for every activity connected with the Kerala PSC, the candidates must submit the photos which have been taken within a year of submitting the application. Name of the applicant and the date on which the photo was taken should be added while uploading the photo. The size of the photo and its clarity will be the same as provided in the previous notification. The photo should of JPG format with a dimension of 150px X 200px while the maximum file size must be 30kb. As applications without photos will be rejected, candidates should take much care and follow the instructions properly. The guidelines on photo upload notified by the Kerala PSC should be read and followed accordingly. It is very important to follow the instructions provided by Kerala PSC. Candidates are advised to read the guidelines regarding the uploading of photo. Color / black & white photos with candidate's face clearly visible, straight and at the centre and shoulder tops clear should be uploaded. Photos should be in JPEG format, and dimensions should be 200 pixels tall and 150 pixels wide. File size of photo should not exceed 30 KB. Photo uploaded should have either white or lightly coloured background. Eyes should be open and clearly perceptible. Photographs should be taken after 1/07/2013, and candidate's name and date of photo taken also must be printed at the bottom of the photo. Photos where candidate is seen to be wearing cap or goggles will be rejected. As the Kerala PSC has rejected the application of hundreds of candidates during the past, it is very important to take due care while uploading the photo. LBS Kerala centre job vacancies online application details are given here. LBS Centre for Science and Technology has invited application for various posts in the Engineering Colleges (LBS Institute of Technology for Women, Poojappura, Thiruvananthapuram and LBS College of Engineering, Kasaragod). Candidates who wish to apply for various posts should provide online applications before 2nd July 2014. Scroll down to know more about the LBS Kerala centre job vacancies 2014.